While there’s nothing wrong with bingo as an activity, there are many reasons to think creatively when it comes to activities for those with Alzheimer’s disease and other kinds of dementia. One of the keys is that the activity should be meaningful for the person. Often, meaning is tied to past occupation or hobbies, so what’s meaningful for one person might not be so for another. Whether you’re caring for a loved one in your own home or for a patient at a facility, consider the person’s interests, occupation and passions. If you work in a facility such as a nursing home or assisted living and don’t know the person’s history, ask their family members or observe their reaction to different activities. Then, choose a few activities they've responded well to and note the areas of interest. As a starting point, here are a few types of people and corresponding activities to consider. For those individuals who primarily took care of a home, you might offer a cloth to dust dressers or handrails, or to wash the table. They might enjoy folding a basket of washcloths and towels, or the task of setting the table. The object here is not to have the individual do large amounts of work, but rather to give the person something familiar and meaningful to do. Just a note here. If you’re using this idea in a facility, you will want to ask the physician for an order that allows therapeutic work and receive permission from the family or resident representative as well. Was your loved one the fixer, the handyman, or the go-to guy? Maybe he’d like to sort through and match up nuts and bolts, or tighten screws into pieces of wood. Perhaps he’d like to connect smaller PVC pipes together. There are also activity boards with lots of “to do” things attached that you can purchase. Give this person something familiar to do with his hands. If his passion is cars, maybe he’d enjoy looking at pictures of old cars or tinkering with smaller engine parts. Some towns hold car events where older cars are displayed or driven down a road. If yours does, consider bringing him to that event. Some cities also have auto groups that will bring their classic cars to your facility as an event. He also may be able to help you wash the car. For the person who sat at a desk and worked with papers, pens and pencils, she might love having a pile of papers to file, an adding machine or calculator to use, forms to complete or documents to read. Some people might like carrying a notebook and pen around to write down information. If music is her thing, offer her opportunities to use this gift. People in the early to mid-stages of Alzheimer’s may be able to sing in a choir or play the piano. I know one woman with dementia whose leads a sing-along almost daily because of her musical gifts. She’ll even take requests for which songs to play, and despite her poor memory, she plays songs almost faultlessly. If he enjoys listening to music rather than performing it, make recordings of his favorite songs and play them for him. Music touches a different part of the brain and many times a sleepy, perhaps bored, person with dementia will start tapping their foot or joining in when he hears a familiar song from his era. Have you ever noticed how people with dementia often brighten up and take note when babies and children are around? A child can often get a response when adults fail. Interactions with children and babies have been a normal part of many people’s lives. Sometimes when a person is living in a facility with other people of similar age or living at home and not getting out often, they no longer interact regularly with kids. Create opportunities for interaction with kids, whether that’s arranging for a visiting time, going on a walk together or bringing by your new baby to a facility near you. There are many benefits to intergenerational interaction, both for the children and the older adults. Some older adults may also enjoy holding and caring for a baby doll. Often, the person connects with that baby doll and enjoys the sense of a familiar role in caregiving for the doll. In the middle to late stages of Alzheimer’s, some people are comforted by holding a stuffed kitten or puppy. I’ve often observed them stroking the fur and holding it close. Is she an accomplished gardener? Provide her with a place to plant seeds, water them and watch them grow. She might also enjoy flower arranging or harvesting and preparing vegetables. Some facilities have raised garden areas that make it easier for people with physical limitations to be able to participate in gardening outdoors. Although people with dementia typically have impaired memories, some of them are still quite capable of doing crossword puzzles, word searches and jumbles. Others might enjoy simple jigsaw puzzles as well. Have some different puzzle opportunities sitting out for your loved one to do. If he collected trains growing up, or is simply fascinated by them, consider setting up an electric train so he can help arrange the tracks or simply watch the activity. You can also gather a book collection or movies about trains. Provide the avid sports lover the chance to mini put, do Wii bowling, play the beanbag tossing game or watch a Little League baseball game. You can also arrange for several people to get together to watch the big game on television and eat some junk food (or healthy alternatives). Or, perhaps he’d get a kick out of sorting through and organizing baseball cards. Art provides a creative outlet to make something, so it provides a purpose and a task. Gather some non-toxic clay, watercolor paints, washable markers, colored pens or pencils, and paper. You can use these materials in a directed way (i.e. “Here’s some clay for you. Today let’s try to make a flower vase” or a non-directed way (“There’s art supplies laid out on the table. Feel free to choose any color of paint to get started.” Clay and paint are great for tactile stimulation and they provide a way to occupy and strengthen the hands as well. Don’t neglect this important area. For many people, as they age, the importance of spiritual nurturing increases. Offer them books of faith in keeping with their tradition, times of prayer or meditation, or singing together. 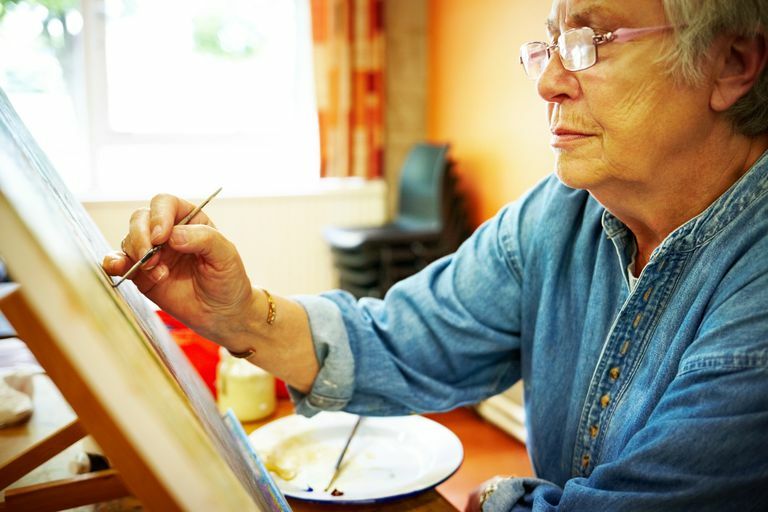 There are many reasons why it's important to offer meaningful activities for those living with dementia. Be sure to base these activities off of the person's individual personality and interests. While implementing this may take some creativity and work, it'll be worth it to see the genuine engagement and joy of your loved one when he feels a sense of purpose in his activities. The Hartford Institute for Geriatric Nursing, New York University, College of Nursing. Conedera, F. and Mitchell, L. Therapeutic Activity Kits.